We had a tremendous experience on Friday evening. 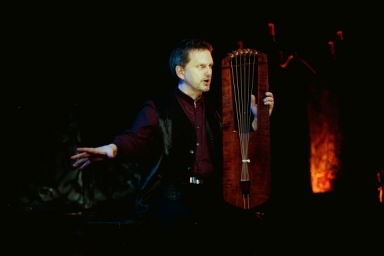 Houston Early Music presented Benjamin Bagby’s Beowulf. What an evening! Bagby recites, sings, acts out, and story tells the first part of Beowulf including his fight with Grendel. He recounts the arrival of Scyld who washes up on the beach as a baby and becomes a great leader of the Danes. Scyld's descendant, Hrothgar builds a magnificent banquet hall for his men but it soon becomes a place of danger as Grendel prowls the hall at night and devours the sleeping occupants. Beowulf arrives with his warriors to help Hrothgar and defeat Grendel. Bagby brought the story to life, speaking in Anglo Saxon. The surtitles were projected behind him on a screen. A packed Trinity Episcopal Church was gently illuminated with candles while Bagby sang and recited the tale while accompanying himself on a reproduction seventh century 6-string lyre. When the last note faded from the lyre and he took his bow, I felt as if I were floating in another time and place. I had a sense of connection between this time and the storytellers of earlier times. The story was as powerful and vibrant in this twenty first century as it would have been in the earliest times. Bagby answered questions afterwards. He discussed his own research into the pronunciation of Anglo Saxon and the history and tuning of his lyre. His website has full details and all aspects of the performance. His next performance is Monday, February 14 in the Prothro Theater, Ransom Humanities Resource Center at University of Texas. It is worth the drive from anywhere!